Today I had a 2 hour Animal Art Fun workshop for children ages 6-12. 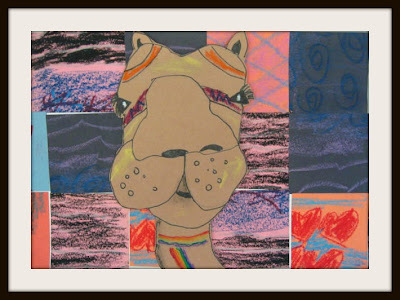 This wide age range posed a challenge for me to create projects appropriate for 1st graders thru 6th. 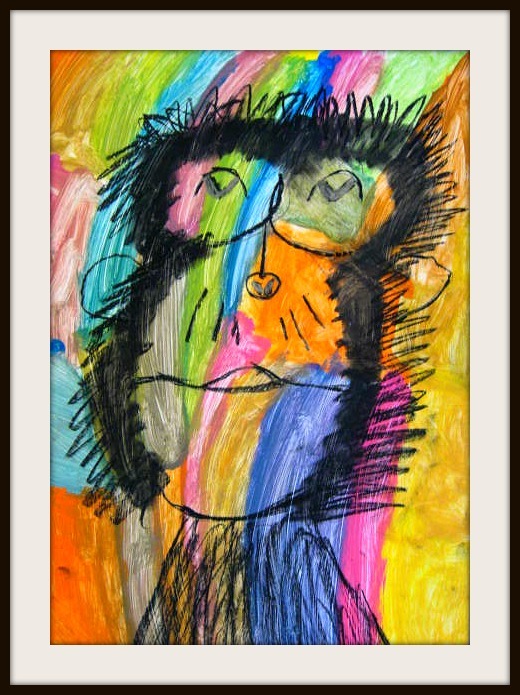 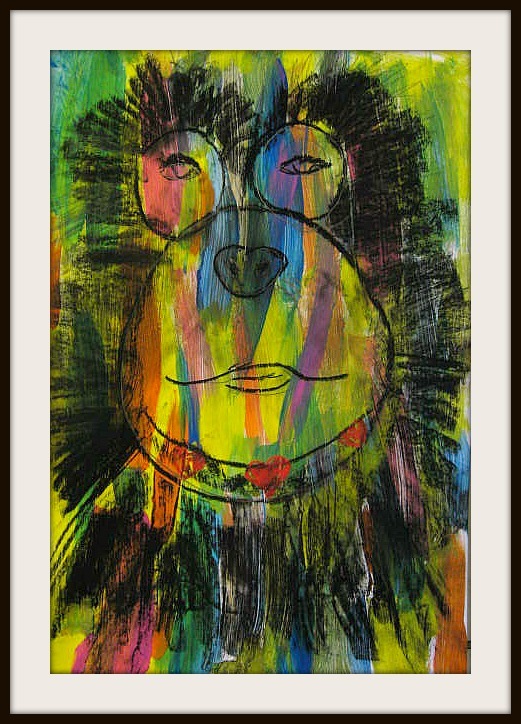 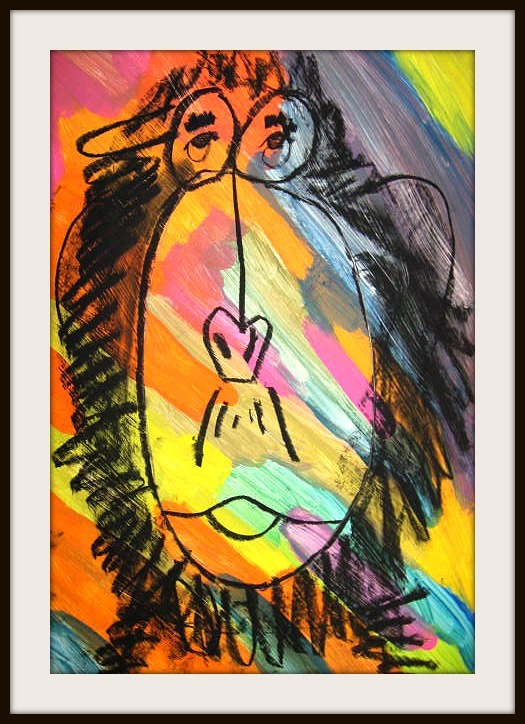 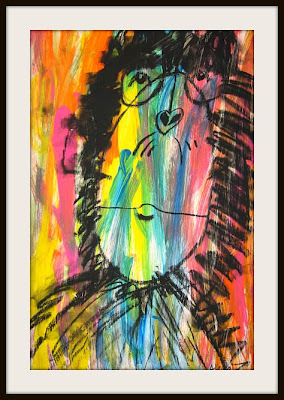 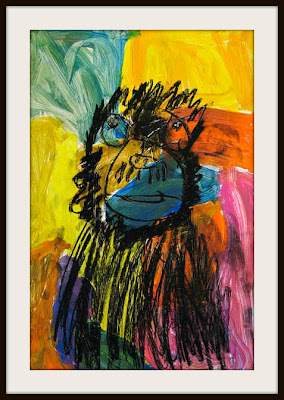 I thought these multi media pop art chimps were basic enough for my younger students, yet would work well for my middle schoolers. 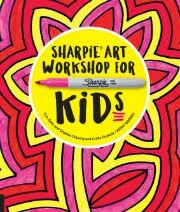 I gave the children acrylics in blue, yellow, orange and hot pink with no water to clean their brushes. I encouraged them to start with the lightest color - yellow, and fill their board with color. 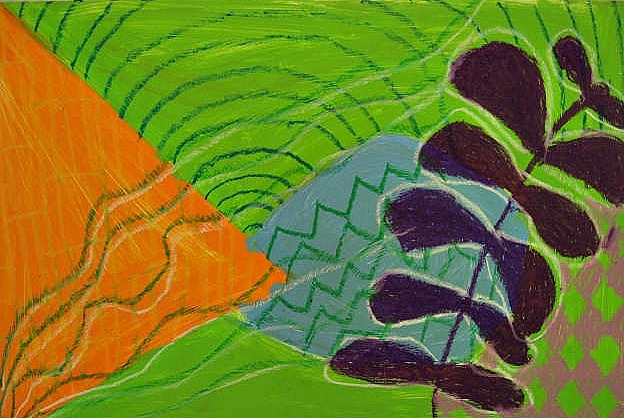 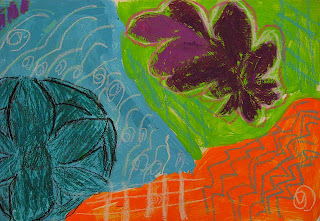 We discussed which overlapping color combos would create beautiful colors and which would create a muddy look (blue and orange) that we were trying to avoid with this particular project. From there, they could approach their painting any way they wished. 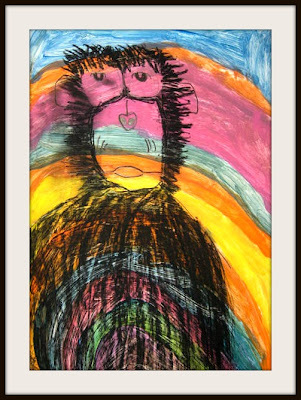 Once the bases were dry, (thanks again to my niece with blow dryer to speed things up) the children followed a basic direct line drawing to create their chimpanzees in charcoal. 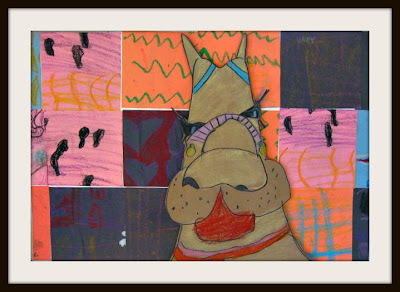 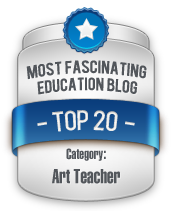 I encouraged them to fill up their page to create bold pop art portraits. 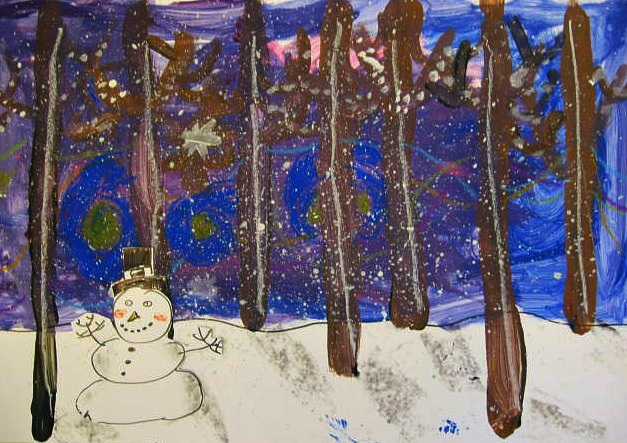 Wishing you all much happiness over the Holiday Season! 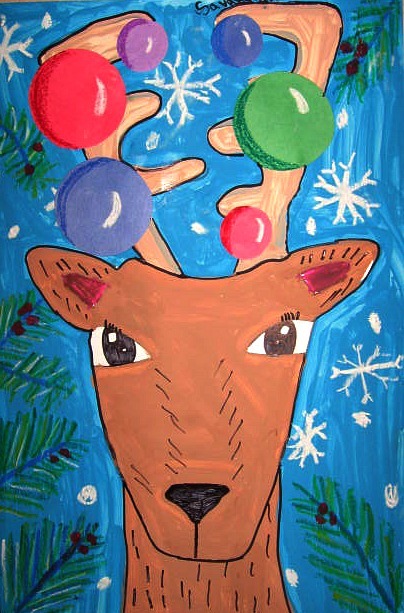 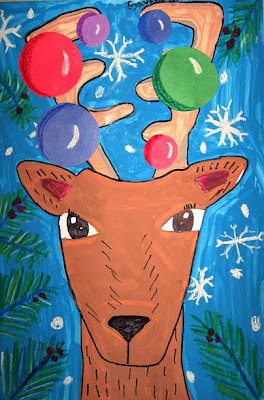 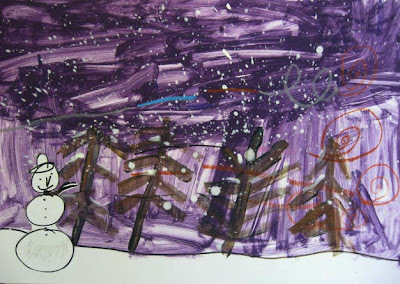 The children did a direct line drawing that they outlined in Sharpie and then painted their reindeer and sky. 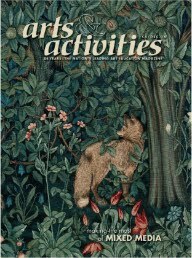 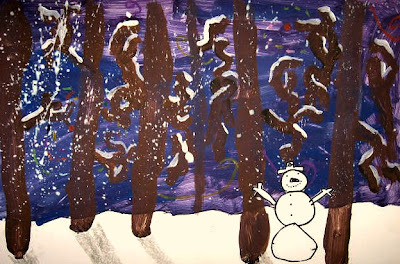 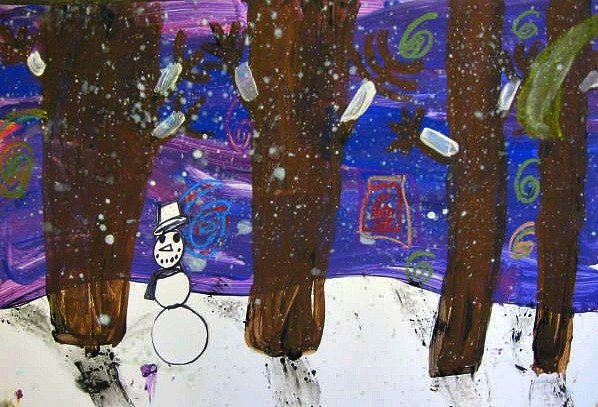 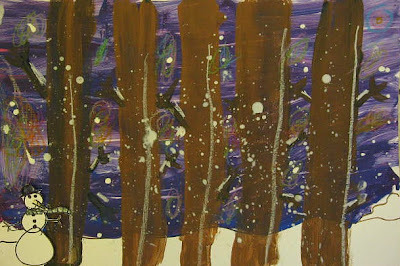 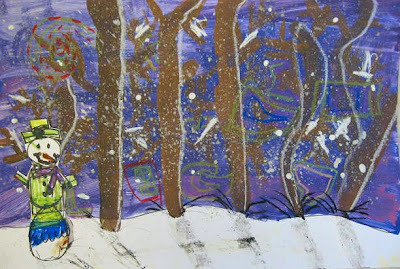 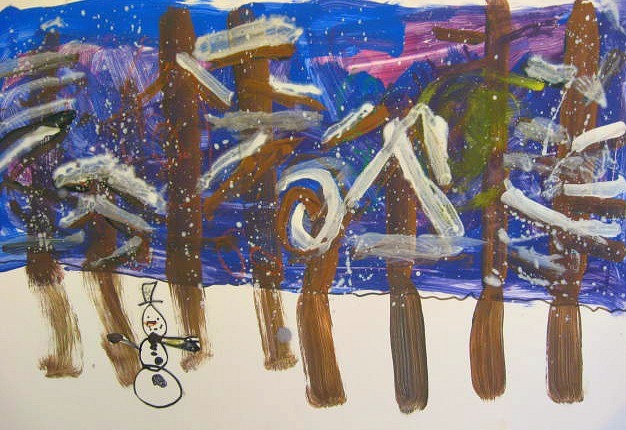 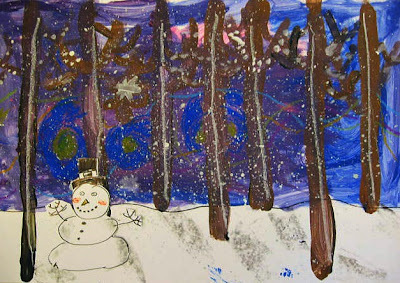 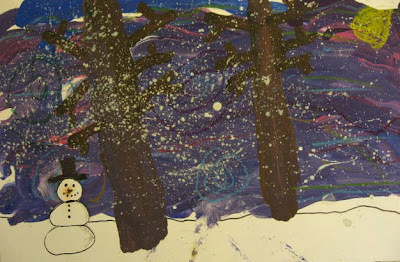 Once dry, they used oil pastel to add pine branches, snowflakes and other details. 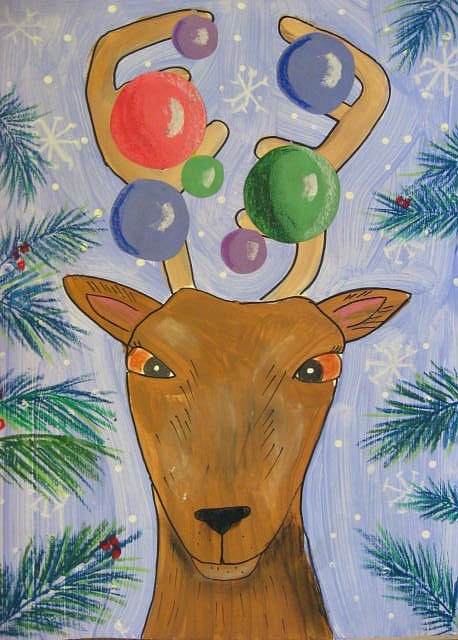 They had the option of hanging Christmas balls from their reindeer antlers. 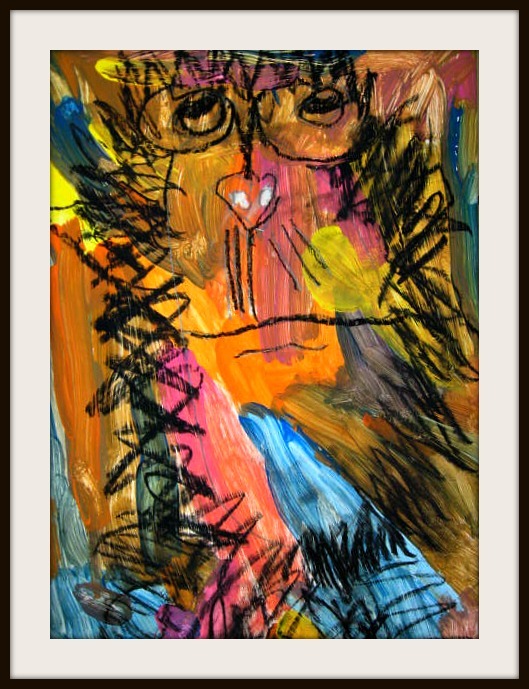 Most were content with a straightforward portrait. 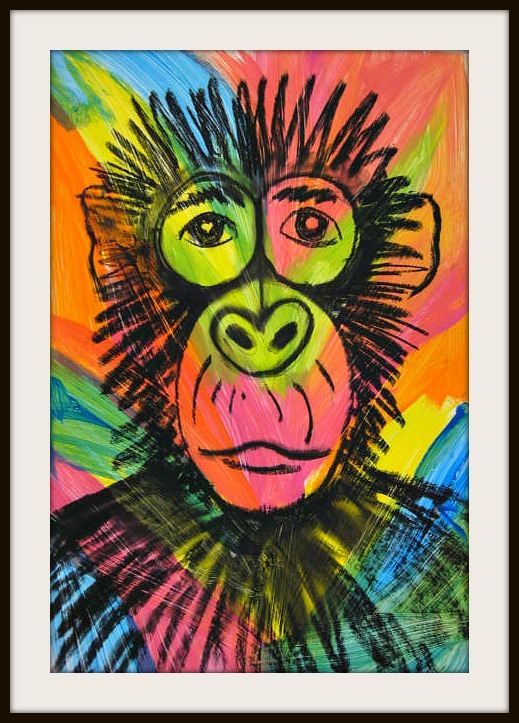 Inspired by this artwork from Artsonia. 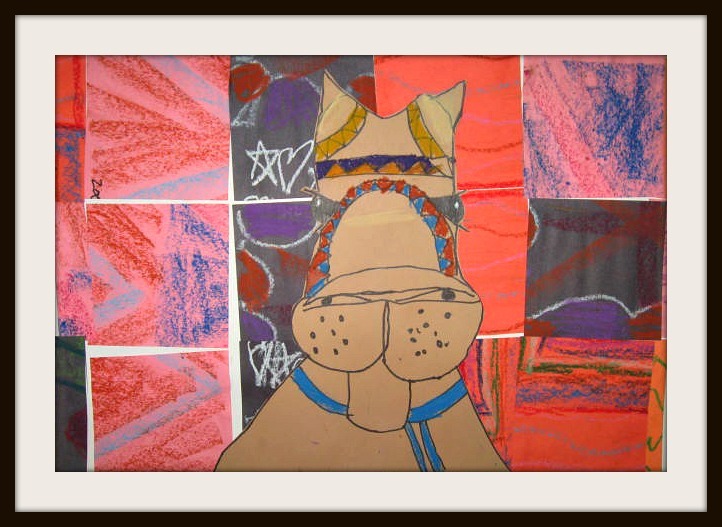 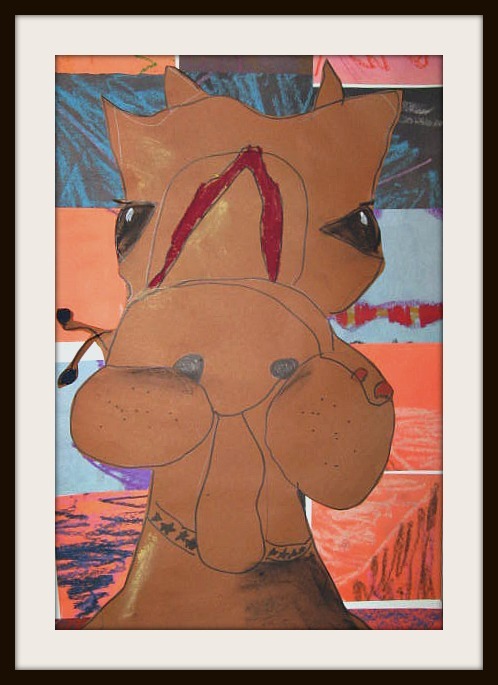 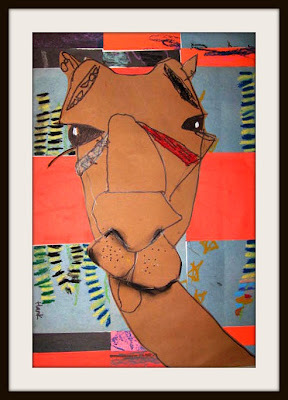 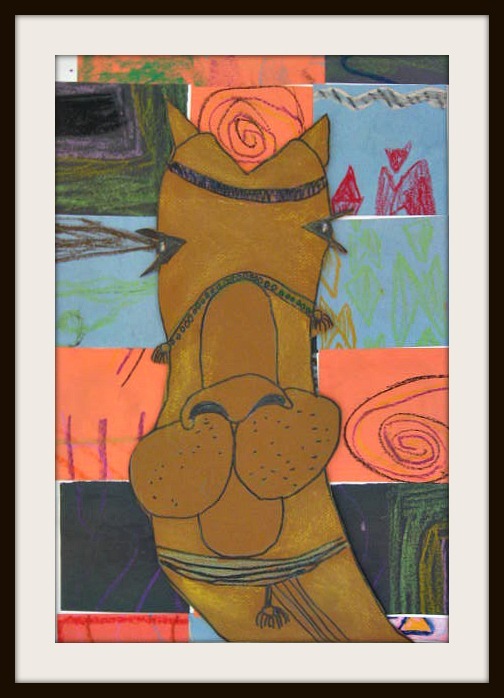 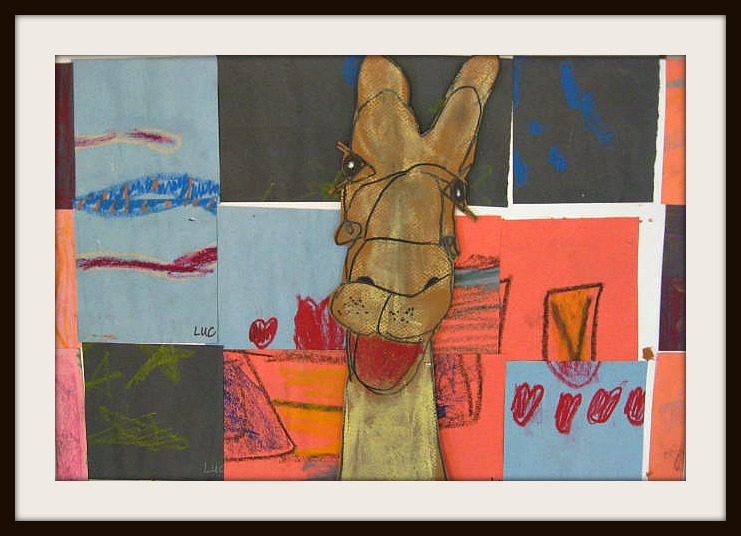 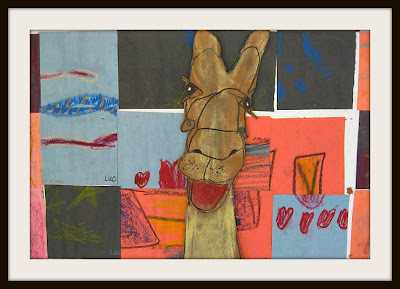 The children chose between a large or regular sheet of tan construction paper for their camel. 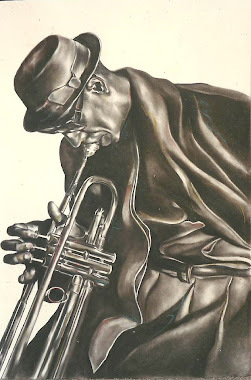 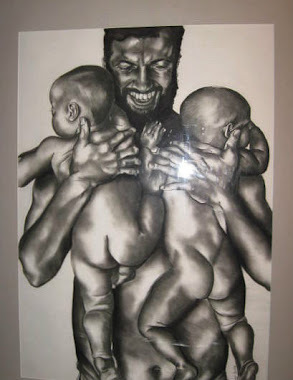 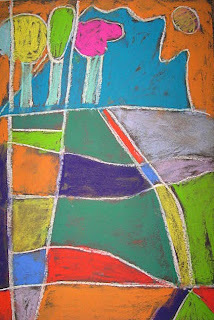 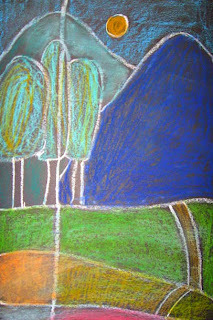 From there we followed a direct line drawing lesson based loosely on this beautiful drawing I saw on Pinterest. 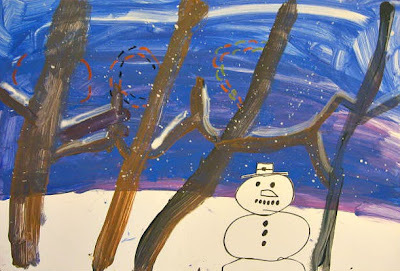 What wonderfully individual interpretations my 1st and 2nd graders created. 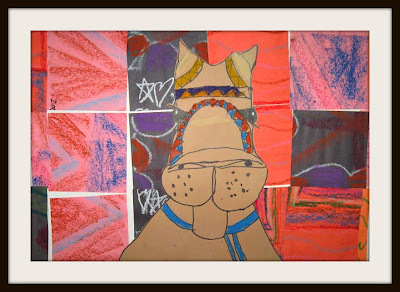 Love their personalities! 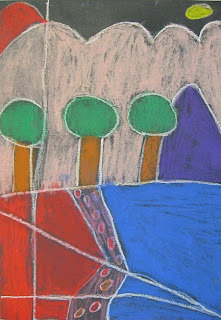 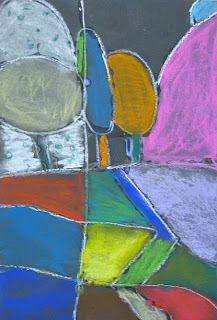 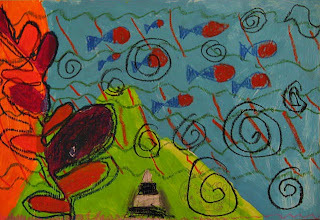 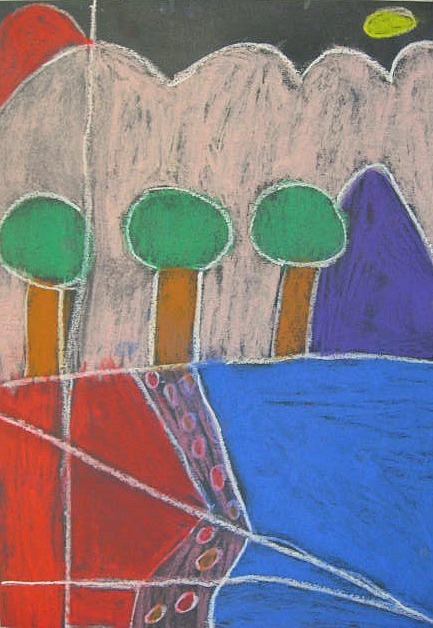 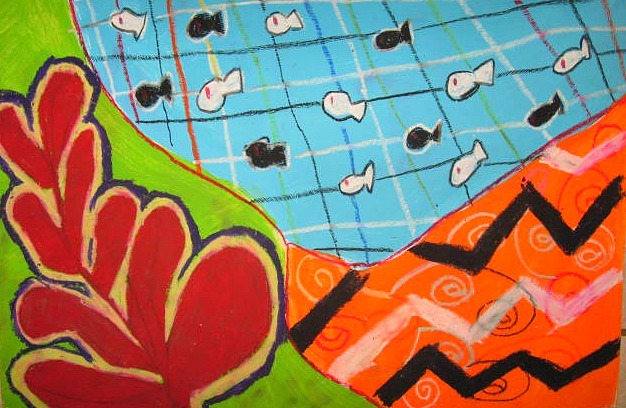 They added details with oil pastel and could use pastel and charcoal to add light and shadow smudges. 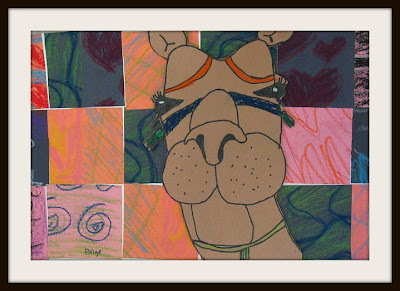 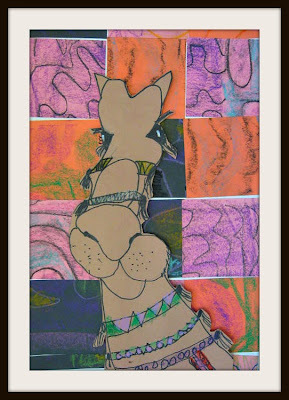 The camels were cut out and glued to their "magic carpet" designs. 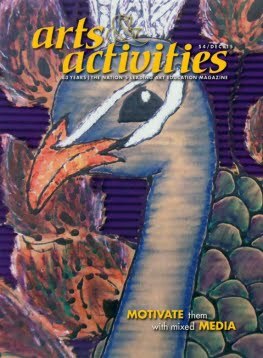 Since I only see my classes for four weeks now, I really try to combine lessons when possible. 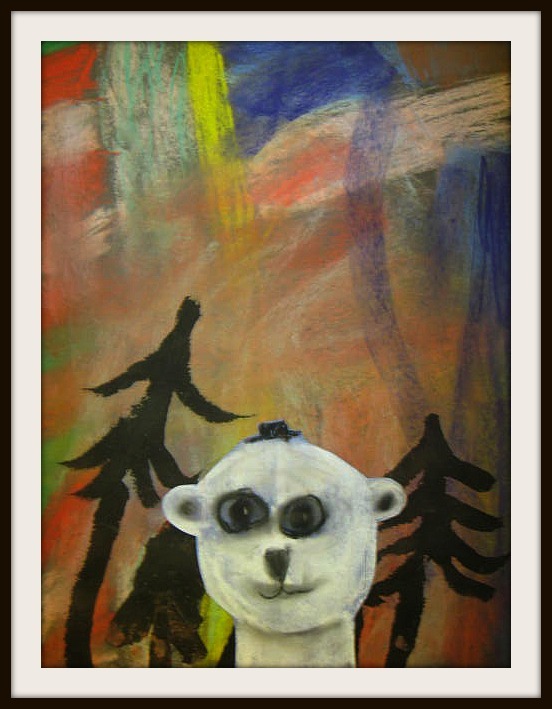 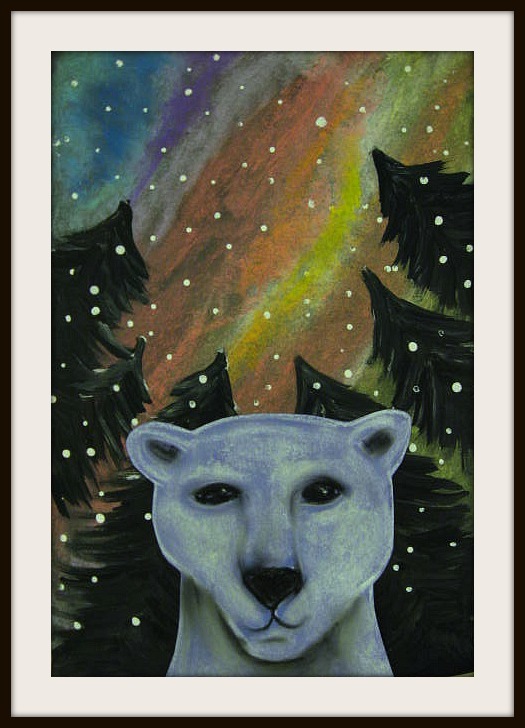 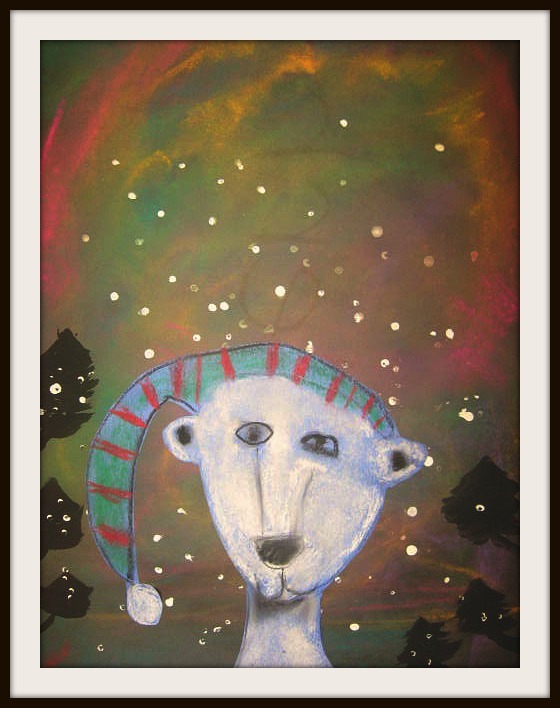 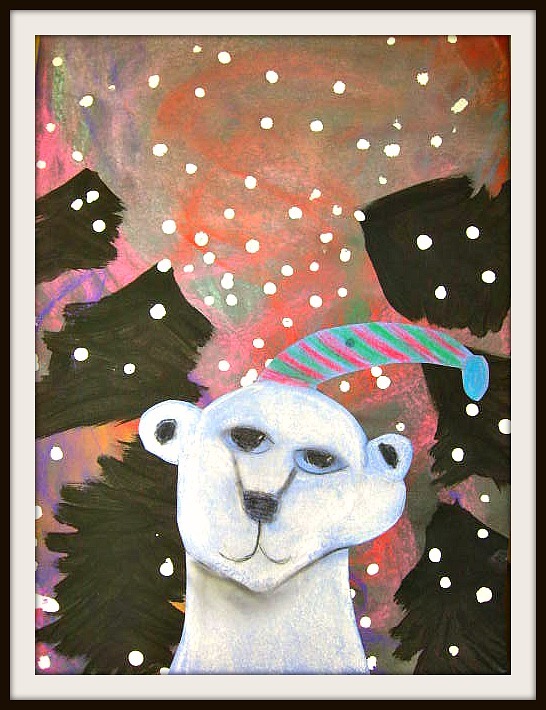 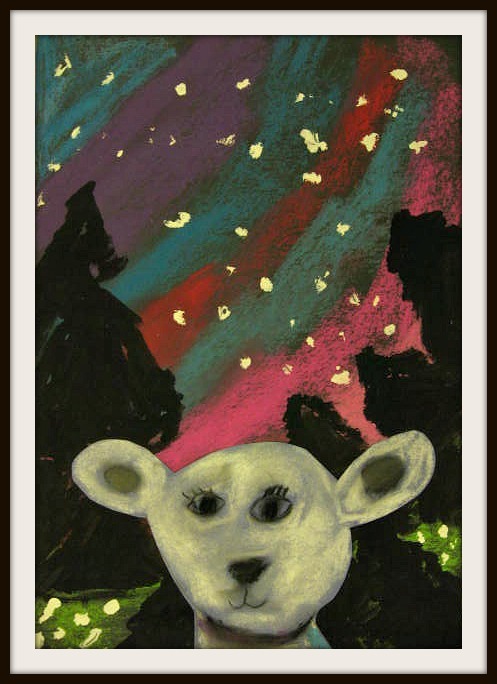 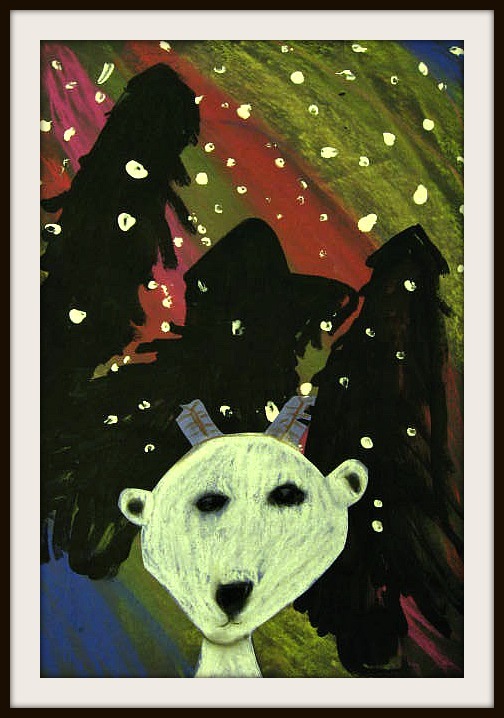 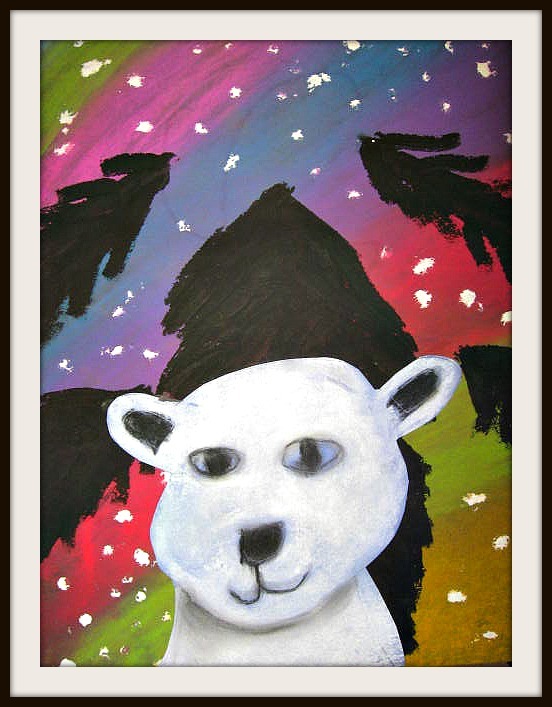 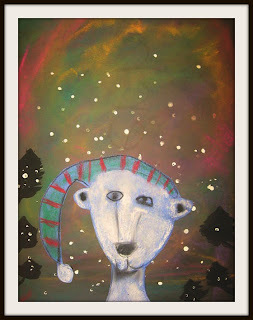 So my Northern Lights with Polar Bear Portraits was a great combo lesson. We made our polar bear portraits first on blue construction paper with white pastel and charcoal. 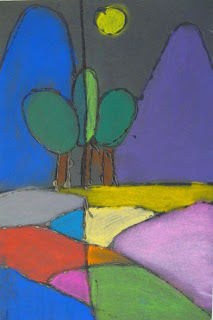 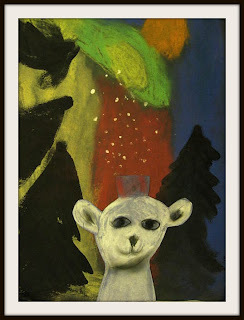 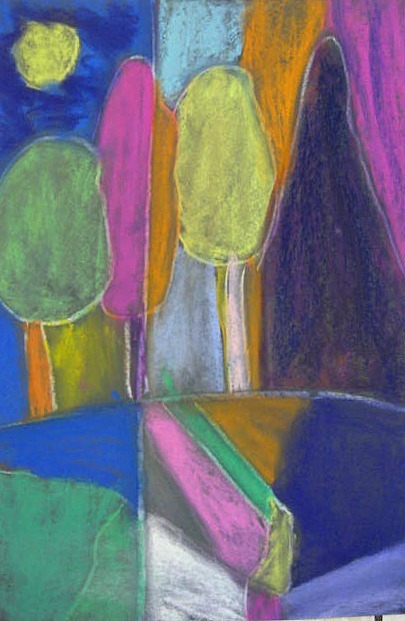 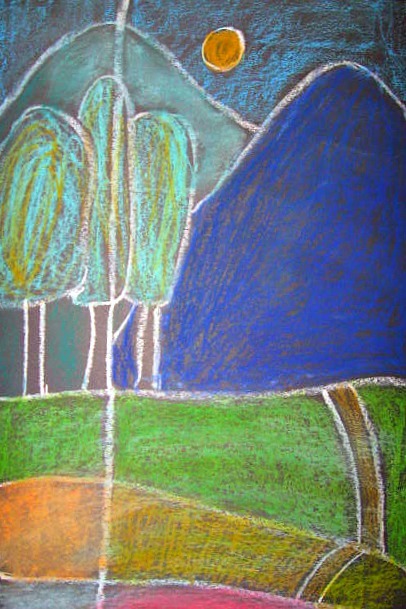 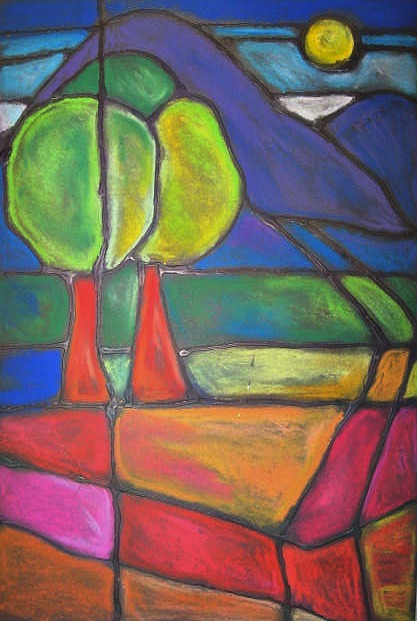 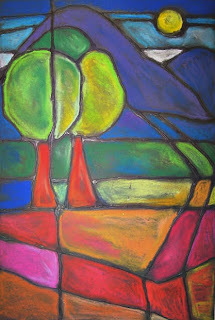 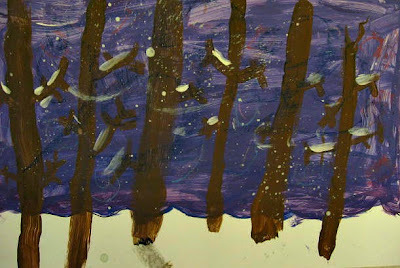 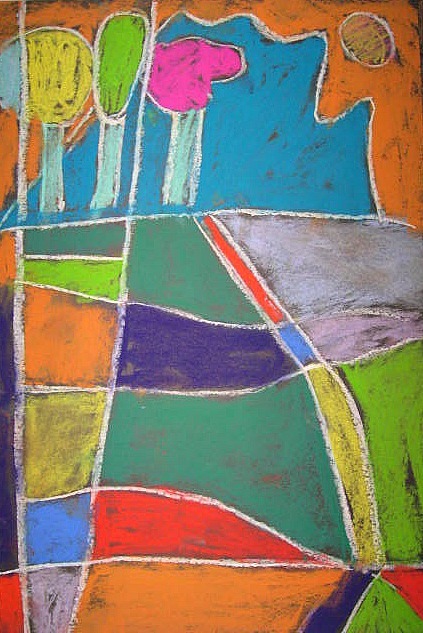 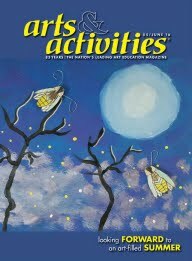 Next we created colorful Northern Light shows with chalk pastels on black construction paper and then pine tree silhouettes were painted with black tempera. 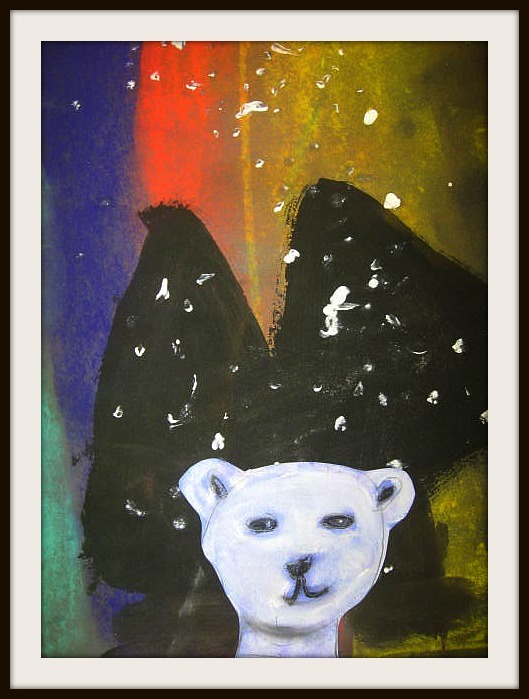 Before adding our cut polar bear portraits, the last touch was a smattering of snow fall dots using the end of our paint brushes dipped in white tempera. 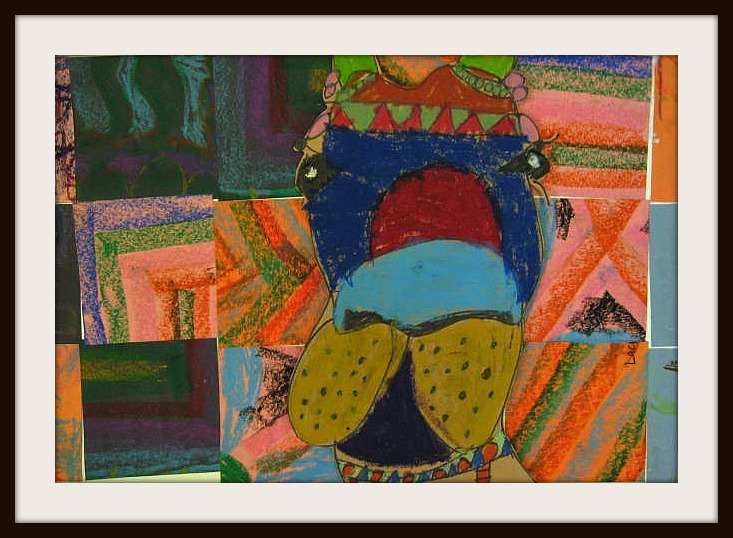 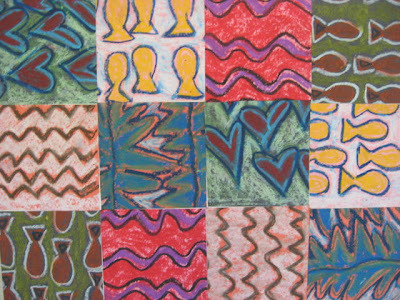 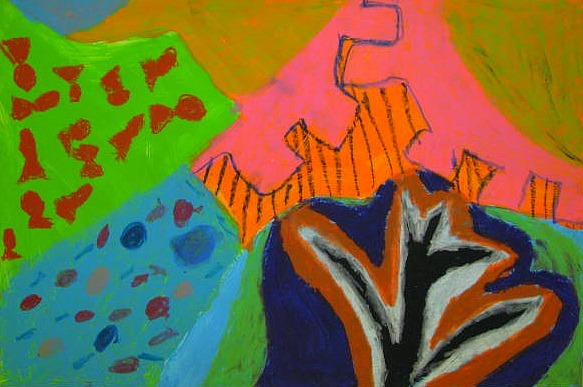 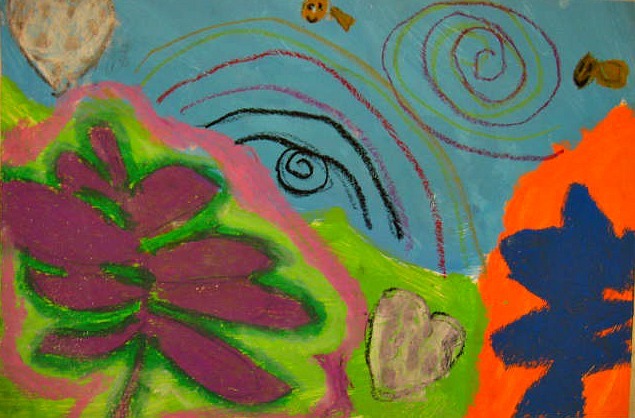 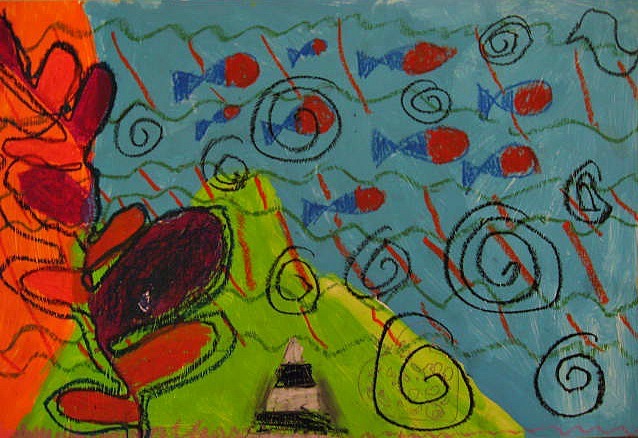 These pieces were created by 1st and 2nd graders.